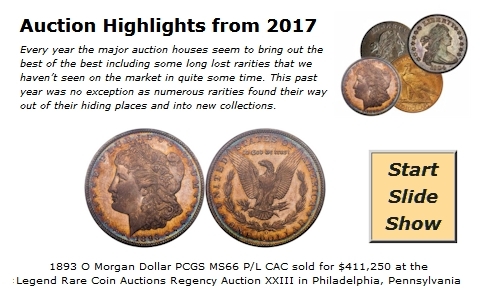 Heritage Auction Galleries hosted another successful sale, this time at the Cincinnati Central States Numismatic Society Convention. Total prices realized were well over $35 million. While a sale of this magnitude has numerous highlights, the obvious choice for this venue was the finest known Class III 1804 Dollar available to numismatists. There are higher grades but they are in museums and unavailable for purchase. This coin is certified as AU58. The buyer was coin dealer John Albanese, who paid $2.3 million for this wonderful rarity. Other highlights include an 1870 S Seated Dollar that brought $503,125 for an XF and an 1876 CC Twenty Cent in MS66 that sold for $460,000. Visit the Heritage website for total prices realized of this amazing sale. This week’s Moderns Wholesale Market Dealer Price Guide lists few changes in most collector series. Modern Lincoln Cents appear a bit more active for some elusive dates, mostly in higher grades. Many of these later dates seem reasonably priced to most collectors. However, when you get into the finest known specimens with low populations, competition remains quite strong. Jefferson Nickels and Roosevelt Dimes are about the least active of the Moderns market. With Gold and Platinum having dropped over the last few weeks, we have a variety of declines listed in the Modern Eagles. Activity appears to be down slightly with most buyers looking for an indication where the metals market is headed. The 2009 $20 Ultra High Relief continues to adjust downward with more inventory coming into the market. Currently, the Market for raw coins is $1,425 and MS70’s at $1,850.